« 5 Ways the Resurrection Gives Meaning to Our Lives…. Yes. Doubt is an expression of our weak belief and a manifestation of our lack of faith. David Wilkerson states, “of all the sins we can commit, doubt is the one most hated by God.” Doubt is not natural, it is a function of our fallen sinful state. We were created to trust God, rely on Him for everything, and cast our hope on Him. Doubt springs from pride and forgetfulness, it grows in isolation from God, and it ultimately will drive us to seek what we need from someone/thing other than God. Throughout the whole of Scripture God is constantly acting, displaying His command of events and history giving us examples of His care for us and reasons for us to trust Him. He displays Himself as sufficient to deliver the Israelites out of slavery, provide for them in the desert, and deliver them into the promised land. And at every turn and every opportunity the Israelites express doubt and fear and turn to idols for consolation. To be known as a prophet in the Old Testament was to be one who had faith in God and did not doubt. Prophets would call to Israelites mired in doubt and fear to return to God, and put their hope and trust in Him. God is utmost concerned that His Glory be displayed in the universe. We do not display His glory when we doubt. That is the message behind Matthews passage in Chapter 14. The account of Jesus walking on the water is sandwiched between tremendous acts of faith and provision. Crowds are pursuing Jesus seeking healing from illnesses. When they hear that he is near, they all surround him by the thousands and he heals them, feeds them and send them on their way. These hordes of sick and wounded people had faith, they overcame their doubts and turned their eye and their hope upon Jesus and he saved them. Thousands believe, but Peter doubts. It is by the grace of almighty God through His Son Jesus Christ that He has mercy on Peter and has mercy on us. He comes to us amidst our doubt with one message, “it is I, be of good cheer, FEAR NOT.” (Fear Not! For behold I bring you good news of Great Joy that is for everyman Luke 2:9, “Let not your heart be troubled, believe in God, believe also in me.” John 14:1) our doubt is overcome with one prayer, cried out in faith, “Lord, save me!” At which point, he is faithful to “stretch out His hand and catch us” and rescue us from drowning. Peter doubted because Peter was a sinner and was fearful. He did not understand yet who Jesus was and why it mattered. This is clear in the next major passage of the text and throughout the gospel of Matthew. Peter is constantly acting with a sort of schizophrenia. In this chapter, he calls out to Jesus as Lord, but sinks into the water because of doubt. In Chapter 16 he will confess Jesus as the son of God, but then will oppose Jesus’ prophesy about the cross. After saying that he would never deny Him, Peter denies Christ three times in Chapter 26. It is clear throughout that Peter had an idea of who Jesus was, but he never fully understood. Peter wanted to put Jesus into a mold. He ha a conception of who Jesus was and who He was supposed to be, his Jesus was the messiah who would lead the people of Israel in rebellion against the Romans; not the man who was to be crucified between two criminals. His Jesus was the king to be served, not the Servant who would wash the feet of His disciples. One would argue that it was not until after the resurrection that Peter, endowed with the Spirit of God, fully understood who Jesus was and why it mattered. As he preached at Pentecost the doubt and trembling is gone and is replaced with certainty and power. “Therefore let all the house of Israel know FOR CERTAIN that God has raised him from the dead– this Jesus whom you crucified.” (Acts 2:36) He doubted because he was a doubter; but the resurrection of Christ and the power of the Holy Spirit transformed his doubt into unwavering belief. So it is for us, as it was for him. Faith without doubt is able to move mountains; Faith with doubt will barley keep us afloat. What causes us to doubt? Doubt is rooted in our failure to accurately understand who God is. God properly apprehended removes doubt. There are really two kinds of doubt; Emotional doubt and intellectual doubt. Emotional doubt is and can be experienced by believers and followers of Jesus. This is the doubt we see on display in Matthew 14. 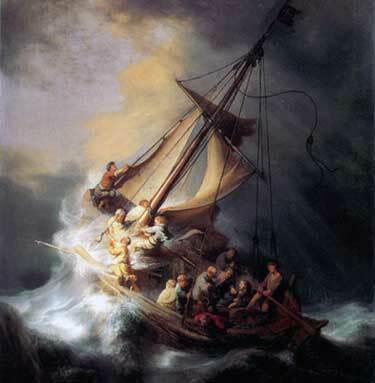 Peter’s doubt arose out of fear, “he saw the wind was boisterous and he was afraid.” God created us with emotions, and the ability to feel fear. Fear was a reflex meant for God alone. The beginning of Biblical wisdom is the fear of God. Jesus’ message in the gospels is that we are to believe in God and fear not; and if we are to fear then we should fear only God, “the one who has the power to cast both body and soul into hell.” When we fear God, we reflect an absence of doubt and a fullness of faith in Him. When we are motivated by fear for anything other than God, we allow doubt to take over. When this happens our only response should be one of repentance, and reorientation toward God, fixing our eyes on Him, from whence cometh our help. Intellectual doubt is less common, and more dangerous than emotional doubt. Intellectual doubt is being faced with the command of God and failing to follow Him because of your own reasoned disbelief. It is not reaction out of fear, but rather the fruit of a proud heart. This doubt is the rich young ruler who approaches Jesus seeking everlasting life. He begins to reason with Christ as to the costs of discipleship, ultimately when faced with the choice of following Jesus or keeping his stuff, he doubted the truthfulness of Jesus’ command and left in despair. Intellectual doubt is Romans 1:21, “for though they knew God they failed to honor Him as God.” Intellectual doubters see God, are faced with Him, and reason that what they see cannot be true or affect their lives. When this happens absent repentance, the consequences are dire and permanent. The only hope for this doubter is a grace given radical understanding of who they are in relation to God. This removes pride and eliminates doubt in who God is and what He has said. Doubt is deadly when it is uncontested and given in to. Doubt is no residence for the Christian, a Christian may visit from time to time, but he/she cannot stay. Jesus commands us to love the Lord our God with all our heart, all our soul and all our mind. There is no room for doubt in our pursuit of God. But doubt does happen. When doubt creeps in and begins to crowd out our view of God we begin to sink. Doubt leads to death when people choose to place their faith in any alternative other than God. Christ is our hope, He is calling out to us and when we have faith we can walk through the greatest storm; and even if we doubt, we must repent and cry out to the Lord, and He will be faithful to take hold of our hand and save us. I doubt there is a God and I really doubt that you speak for him. I Can’t say as though I believe that I speak for him, my hope is that his words will speak for themselves.